Needlepoint Eyeglass cases are some of the easiest projects to make. You can stitch them in simple tent needlepoint stitches or intricate Bargello patterns like this African Accents design. In this tutorial, you’ll learn how to make a needlepoint eyeglass case from start to finish with an original free Bargello Flame pattern created specifically for this project. Designed for needlepointers of average or intermediate skill who know how to work two or more stitch combinations and use full-color schemes, the needlepoint design is 6.5 inches wide and 6 inches long. You will produce a 3 and 1/4-inch by 6-inch finished case that will accommodate most stylish wide-frame eyeglasses. With the versatile do-it-yourself needlepoint project, you can make the case even larger to accommodate both a regular pair of glasses and some sunglasses as well. And, if you wish to scale down the project to fit stylish reading glasses with narrow frames, reduce the number of motifs in the needlepoint pattern to tailor it to fit. No matter the size you decide to make, this needlepoint eyeglass case will be an item you’ll enjoy giving away as well as keeping for yourself. Before gathering materials and supplies, download the free needlepoint eyeglass case chart and enlarge it so that you can see the individual stitches. The pattern was adapted from African print fabric. You get more than enough of the charted design to make it easy to complete the project. Find the bold arrows to locate both the vertical and horizontal centers. Then, draw intersecting lines to find the actual center of the chart. Once you prepare the canvas for stitching, you will transfer these markings it. Since this is a Bargello design, you will make stitches over multiple mesh threads using the chart's grid lines instead of individual squares. Each line displays the number of threads to cross as well as the beginning and end of each new stitch. Print at least three copies of the enlarged chart: one to use for notes and for marking the center to match that of the canvas; one clean copy for reference as you stitch; and one for saving in your needlepoint project files. One 9-inch square piece of good quality 13-mesh mono needlepoint canvas or a piece that's sufficient for the desired finished eyeglass case with two additional inches on all four sides. Nine skeins of Single-Ply Tapestry Yarn or three-ply Persian Yarn in your choice of colors. If you decide to use Persian Yarn, you will have to stitch with all three strands in the needle. Make sure to have enough thread on hand to complete the project. Two sets of 9-inch Stretcher Bars or one Needlepoint Scroll Frame to fit the exact size of the canvas. These tools help the needlepoint design maintain its shape. Do not use an embroidery hoop; it will distort and damage mesh threads. Masking Tape to bind canvas edges and keep them from unraveling. Brass Thumb Tacks or Staples to attach the canvas to stretcher bars. Fine-Point Permanent Fabric Marking Pen that does not feather or bleed to draw the center lines and pattern shape. One 7.5-inch by 7-inch piece of Lining Fabric: Ultra suede (used to finish the sample), velveteen, corduroy or other suitable fabric. Other regular needlepoint supplies including scissors, frame magnets, and hand sewing needles. If needed, trim the piece of canvas to the required size and tape or hem the edges. Assemble the stretcher bars and attach the canvas with brass tacks or staples by gently pulling it on all sides for an even tight fit. Re-stretch as needed during stitching to keep the design taut. If you are using a scroll frame, use a running stitch to baste the canvas to the fabric tape on each end of the frame. Draw a vertical line down the center to mark the fold line of the eyeglass case. Repeat with a horizontal line to mark the center stitch placement. Look at the needlepoint chart to make sure you have the correct placement. Bargello patterns are made of straight needlepoint stitches worked over two to six vertical or horizontal canvas threads instead of diagonally over intersections. As a result, when reading the needlepoint chart, you will have to count these threads and step up or down depending on the color to make the next stitch. Read more about Bargello Step. Stitching for most Bargello patterns starts in the center. It is usually the guideline for reading the Bargello chart and its pattern repeats. Accuracy is essential, so count the stitches carefully and follow the design until you have established the pattern. The center line should begin and end at the same point in the design. 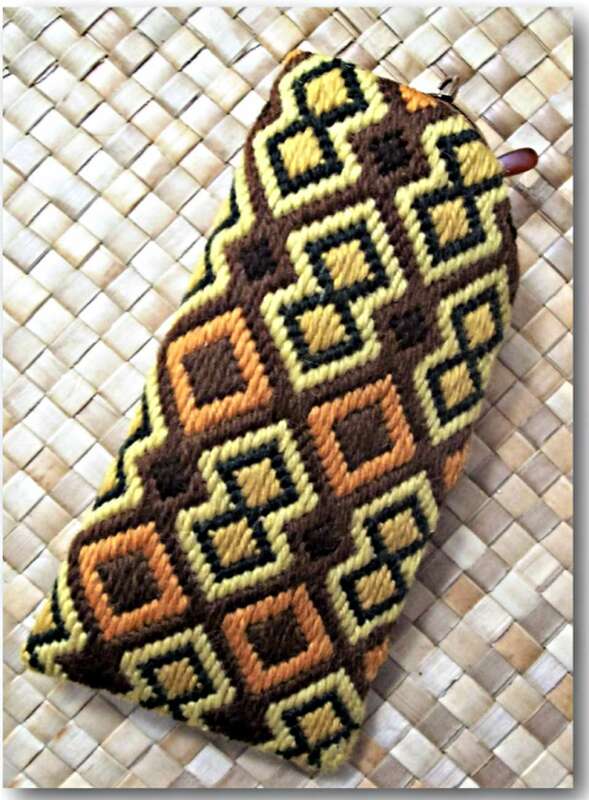 Stitch this needlepoint eyeglass case in a complementary color scheme on #13-mesh canvas. The African Accents Bargello Design has a repeat pattern that begins with the center motif. Once you get a "feel" for the pattern, it becomes easier to work the remaining rows and with only an occasional glance at the chart now and then. Following the African Accents needlepoint chart, begin working at the center stitch, counting the threads and steps to complete the first motif. Once you get to the brown outline, do not fill in any more motifs; but work this shape carefully over the entire canvas to balance it on all sides. Stitching the complete outline first makes it easy to fill in the remaining motifs. Use one 18-inch strand of Tapestry Yarn at a time to maintain even tension and for proper coverage. Do not make knots when beginning and ending threads. Work a short tail of thread through the back of a few stitches of the same color on the reverse side of the canvas to secure it. The pattern calls for a few single needlepoint stitches. To keep these stitches from sinking into the canvas, go over them twice so that they remain visible; or work them with the Half Cross Tent Stitch. Check and recheck your stitching to be sure you have accurately counted the pattern repeats and have not skipped rows or made stitching mistakes. Stitch two rows of Continental Stitch around all sides of the completed needlepoint to be used for final finishing. Bargello projects worked on a frame, or stretcher bars rarely need a lot of blocking— only enough to reset the sizing on the canvas and fluff out the thread. Block the finished needlepoint on the same frame or bars by re-stretching and re-mounting (the piece will have become loose by stitching). Lightly steam with a hot iron and wet cloth underneath the needlepoint and let it dry. Trim the blank canvas on each side to 6 threads before the stitches. Using this shape as a pattern, cut out the lining. Turn all four canvas edges to the wrong side up to and including the two rows of the Continental stitch so that no blank canvas is visible. Gently press the edges and tack down with sewing thread. Fold the needlepoint in half vertically with wrong sides together, making sure the edges match along the bottom and the sides. Join with a binding or whip-stitch across the bottom and then up the side. You will need a sewing machine to finish the lining. Fold the pre-cut lining piece in half with right sides together. Sew the bottom and side seams, reinforcing the top side edge with extra forward and backward stitches. Trim the seam allowance to 1/8 inch and do not turn inside out. Fold the top edges inside about 3/8 inch. Steam press gently. Insert the lining as prepared into the needlepoint case. The wrong sides will be together. Sew the lining to the top of the case with whip-stitches or small straight hand-sewing stitches (depending on the fabric). Push the lining down into the case and make a little invisible tack sewing stitch to anchor it to the bottom or side of the finished eyeglass case.